robert w. sternfels: Pilot B24 "The Sandman"
1st Lt. Sternfels and his crew soon found themselves in Benghazi, Libya as part of the 98th “Pyramidiers” Bomb Group, preparing for one of the most historic raids of WWII; Operation Tidal Wave, Low Level, the Ploesti Raid. Their aircraft, “The Sandman”, was so named by the crew. 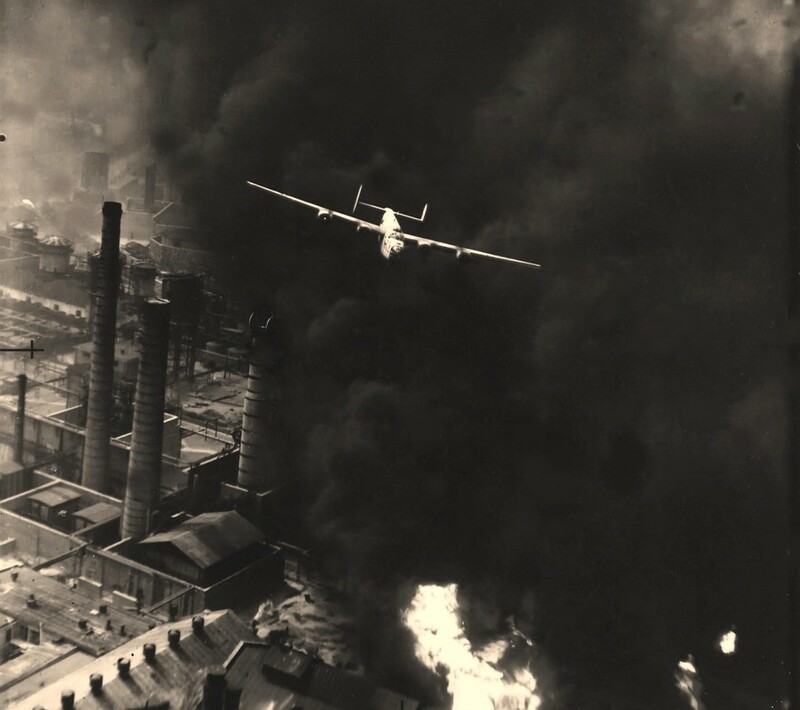 The Ploesti raid of August 1943 was devised to destroy the oil refineries at Ploesti, Romania, which produced almost 40 percent of the German fuel and oil requirement. This was the only location that Hitler got his Avgas (aviation fuel) from. A prior raid in June of 1942 (the Halpro crew) was performed at high level and with targets obscured by clouds with limited success. The Ploesti raid of August 1, 1943 was to be the first low level bombing raid performed by B-24s. Above: B-24 “The Sandman” heavily overloaded, ready for takeoff for the raid, note the oleo struts were bottomed out, and typical dust in the area in the background. 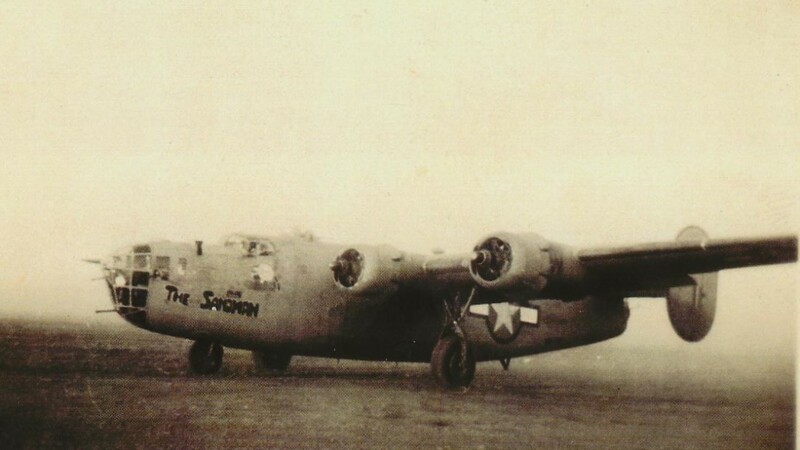 Five Bomb Groups consisting of 178 B-24 Liberators were dispatched from Libya for the bombing mission. There were 1780 airmen on this 2700-mile-long mission with bombing from 200 feet above the ground at 250 miles per hour. 54 Liberators were lost and many more badly damaged. Nearly 500 airmen were lost and over 200 more were wounded. Above: B-24 Liberator “The Sandman” of the 98th Bomb Group, piloted by 1st Lt. Robert Sternfels, over Astra Romania, August 1, 1943 during the Ploesti raid. This iconic picture is said to be second only to that of the Doolittle Raiders B25’s departing a carrier. Note: The original file photo (courtesy of the USAF Museum) shows the smokestacks to the left of “The Sandman”; this was due to the photo being taken using a mirror in a B-24 ahead of “The Sandman”. The mirror was installed outside the aircraft with the camera focused on the mirror, resulting in reversal of the image. This was not known by the personnel developing the image and is the reason the National Archives photo shows the smoke stacks to the left of “Sandman”. The image shown here has been reversed to show the correct orientation per the Pilot of “The Sandman”, Robert Sternfels and has also had “handling damage” scratches to the image removed. Clearance from the wingtip to the smokestack was approximately 43 feet. 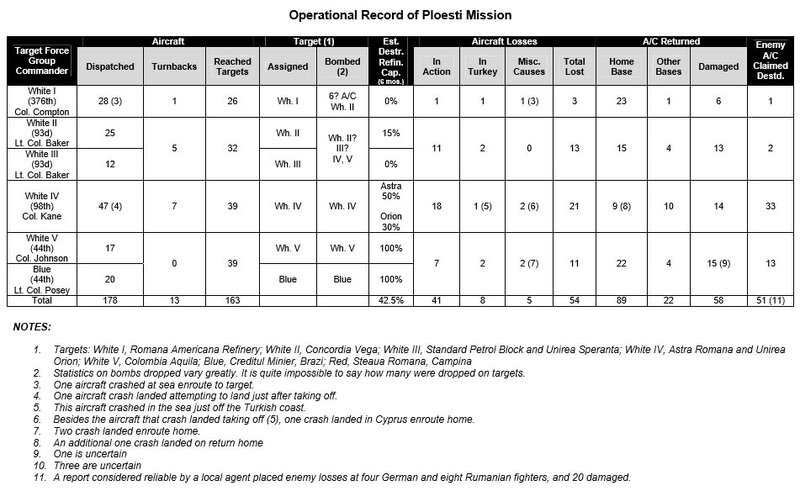 ​Per Mr. Sternfels, the below operational record of the Ploesti Mission (courtesy of the National Museum of the US Air Force), does not accurately depict what transpired on the mission. The first two bomb groups were the 376th (leading the mission) followed closely by the 93rd. Prior to arrival at the 1st Initial Point, the mission leader assumed the role of navigator and made a wrong turn. 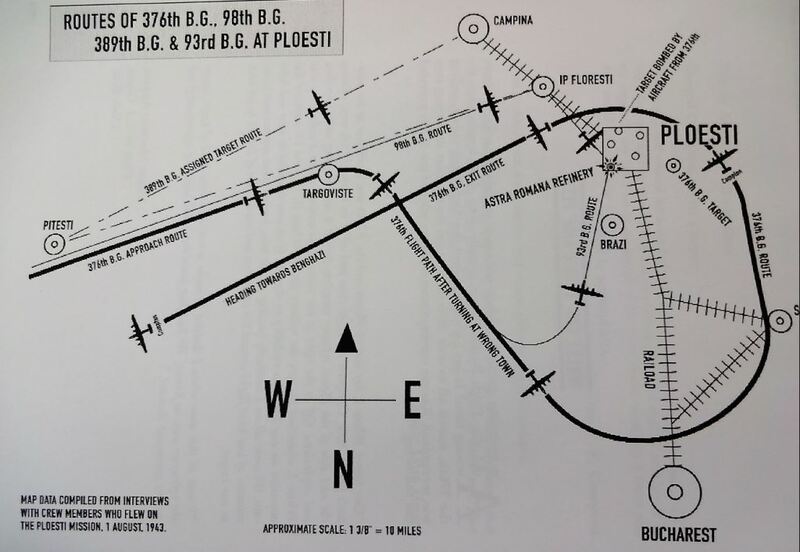 This navigational error by the Col. Compton group resulted in the 376th deviating from their assigned target and subsequently seeking targets of opportunity (which turned out to be marshalling yards near the rail yards). Initially following the 376th at the erroneous turn, the 93rd also broke formation early. This resulted in the 93rd also not making it to their assigned target and seeking “targets of opportunity”. The 93rd ended up striking the assigned targets of the 98th setting them on fire and leaving unexploded delayed fuse bombs. At the time of the wrong turn by the lead group, the 98th, followed by the 44th and the 389th were out of sight behind the first two groups and flew their missions as planned. This resulted in the 98th “Pyramidiers” making their bomb run unable to see the ground and flying through smoke, fire and unexploded delayed fuse bombs earlier dropped by the 93rd. This was a major reason limiting the overall success of the mission. However, the raid by the 98th Bomb Group on Astra Romana was assessed to have destroyed 50% of their refining capability with losses to the 98th Bomb Group exceeding 44%. Out of this mission came many hero’s; five Medals of Honor were awarded (three posthumously). All participating airmen were awarded the Distinguished Flying Cross in addition to other awards for valor. 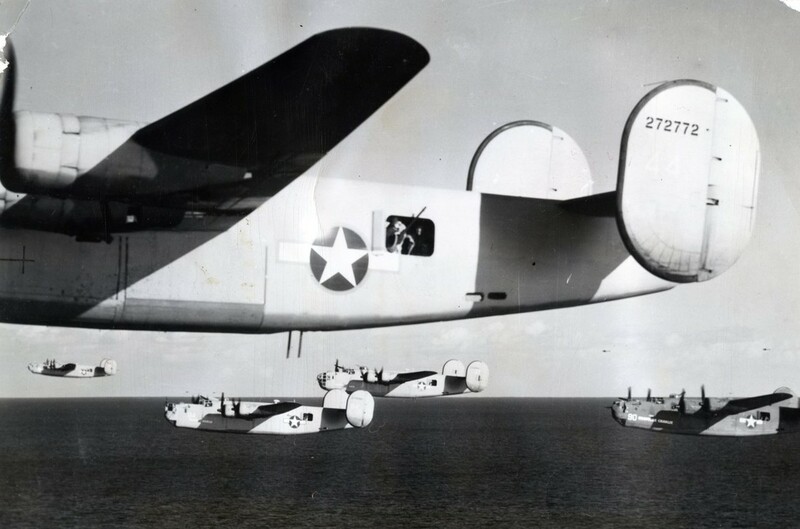 This became the most decorated single aviation mission in US history. 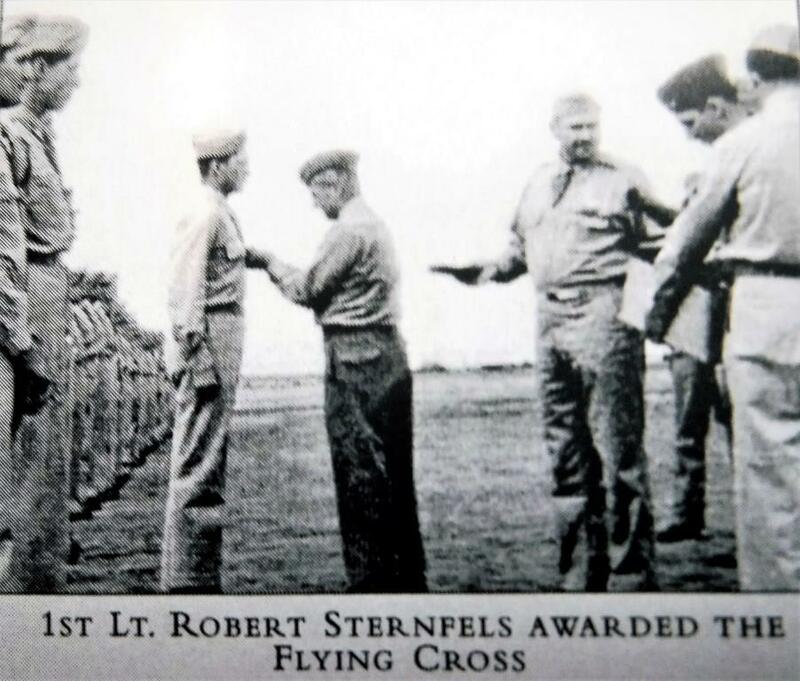 1st Lt. Sternfels earned the Distinguished Flying Cross for his participation in the Ploesti mission and this honor was presented to him by General Jimmy Doolittle. 1st Lt. Sternfels was promoted to Captain at the age of 23 and became squadron commander of the 98th Bomb Groups 345th Bomb Squadron. 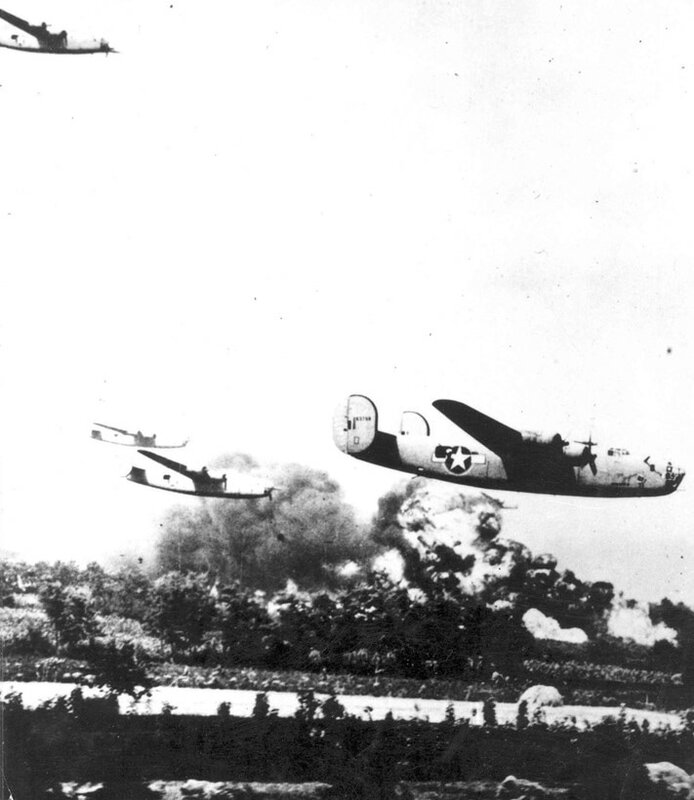 Per Mr. Sternfels, the B-24s led the raid at Weiner Neustadt, otherwise they would have overtaken the slower B-17s. Mr. Sternfels reports almost 500 aircraft were involved in the raid. Captain Sternfels was subsequently promoted to Major, still at the age of 23. After completing his 50 combat missions Major Sternfels was awarded the Air Medal with clusters and returned to the US in March of 1944. An interesting side story; back in the states, Major Sternfels eventually returned to work in sales of dental equipment, a job he had started as a teenager. Some years later, Mr. Sternfels met an engineer with the same company he was employed at, who had been a German anti-aircraft commander during the Ploesti raid. Mr. Sternfels, now 97, was recently honored as Patriot of the Year in Laguna Beach California where he resides. We are so grateful to him for his service and thank him for allowing Warbirds Unlimited to help ensure these historic events and the incredible people who participated are never forgotten.